This makes good use of the foodstuffs I indulged in on my non-fishing trip to Scotland. First, make the sweet pastry. In a food processor or mixer (or by hand), cream the butter and caster sugar together until they’re light and fluffy. Slowly add the beaten egg-scraping the sides of the bowl every so often if you’re using a mixer-until they’re well mixed in, then slowly fold in the flour. Mould the dough into a flat ball, wrap it in clingfilm and refrigerate for 30 minutes. To make the filling, mix all the ingredients except the walnuts in a food processor or mixer until smooth. Then, fold in the walnuts and mix well. To assemble, roll the sweet pastry on a well-floured table to about 5mm thickness. Grease a large 25cm tart tin, line the tin with the pastry, pushing it into the corners of the tin with a ball of floured spare pastry. Leave the edges hanging over the sides of the tin. If there are any breaks in the pastry, patch them up by pushing the pastry together or pushing in some spare pastry in the gaps. Pre-heat the oven to 180˚C/gas mark 5. Fill the tarts with the walnut mixture and bake for 20-25 minutes until lightly golden. Serve with vanilla ice cream, crème fraîche or thick double cream. You’ll need to invest in a waffle-maker-either an electric one, or a more traditional stove-top model. Last year, I bought a lovely vintage waffle iron from 1910. Although it’s fully functioning, it’s so beautiful that I decided to hang it up in my kitchen as an ornament. Put the flour and the caster sugar into a large mixing bowl and whisk in enough milk to form a batter thick enough to coat the back of a spoon. Whisk in the egg yolks, vanilla essence and hot butter. In a separate bowl, whisk the egg whites, salt and sugar to form soft peaks, then carefully fold into the batter. Lightly oil a waffle iron, pour in the mixture and cook for 3-4 minutes for an electric model, and 3-4 minutes on each sides for a stove-top model, until golden, then keep warm. 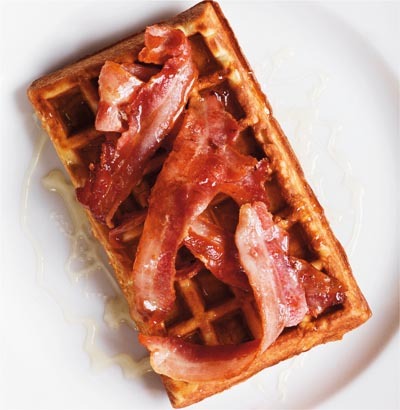 Meanwhile, either grill or fry the bacon until crisp, and serve on the waffles with the honey spooned over them.